Our New Unified Portal is going live today and there are quite a few major changes. I will keep it very concise, each and every line below is important and please go through the whole announcement. Both are independent and DO NOT sync. So changing passwords or registering at any one of them does not sync across. So, stick to new Unified system once your club has been migrated. Old forum and new forum both will be available, no links will be broken, these links will be available in the top menu of all sites. All login links once migrated will be switched to new system login screen. IMPORTANT, logging in the new system does NOT log you in the old system. For old system logins, you will need to use the following links. JoomlArt data take precedence over migrating usernames / passwords. First, the JoomlArt users are migrated to the new system. Next, for example, we import JomSocial users but we match the emails to see if the user already exists. If yes, then we import only the membership info. Same steps will be performed for each of the clubs. Only one password is retained in the new system and that password would be from the first imported data, merge and compare will only import membership, plan info and permissions. Example: If you have an account on JoomlArt and also on Gavick with the same email. Then the username and password of JoomlArt will work for you. Only the membership info from gavick will be merged on import. Easy to use download system with powerful search can be accessed through the user dashboard. We are sure you are going to love it. Once migrated, all download links will point to Unified Download System. New Premium Ticket System has been implemented. Free Ticket Support : includes general, sales, presales or account related support. This is available for all members. Premium Ticket Support : Complimentary to Developer and Ultimate Developer members. Others can subscribe to Premium Ticket Support by purchasing the same from Add ons section of User DashBoard. Lifetime Members Support : Gavick and JoomlaBamboo lifetime users have dedicated categories for ticket support. These members do not have access to paid product support in the forums. Pass on the benefits of our acquisitions of JomSocial, iJoomla, Gavick and JoomlaBamboo to everyone by reduction in pricing and removing limitations. Simplify pricing plans. All template clubs no longer have domain limits or rebranding limitations. Absolutely no intention to extract extra money from anyone. Old Developer plans offer extended benefits within the same site. 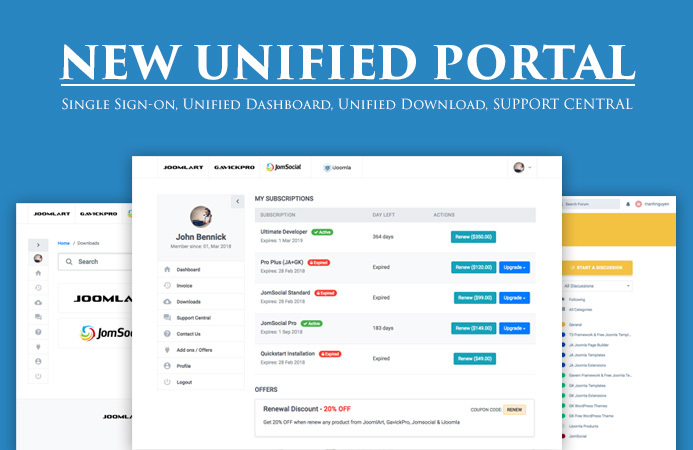 New Developer plan offers Developer level access across all template clubs (joomlart, gavick & joomlabamboo) and Ultimate Developer plan includes JomSocial and iJoomla too. Ultimate plan is currently being offered at $299 (promotion). If you have paid full amount of $299, you can request free upgrade to Ultimate Plan. If you have bought old developer plan on discount, you can upgrade to Ultimate by paying the difference amount. Its an upgrade NOT renewal, the expiry date will remain the same. Not applicable to lifetime members of gavick and JoomlaBamboo. Raise a ticket for queries, upgrade info. Gavick lifetime users were promised 6 months of updates and that ends on 30th April 2018. JoomlaBamboo lifetime users will similarly receive 6 months of updates. The support is lifetime and limited to tickets only. Forum support is not available for lifetime members. Ultimate plan is on discount rate of $299, which if bought individually would cost above $1500. Only Renewal discount of flat 20% is available for all plans, which has to be used before expiry of the plan. Anyone wishing to upgrade, renew can raise a ticket and we would be glad to offer options to choose from. It is a complicated migration, so there are high chances that we might have missed few things. With over 500,000 users in the JoomlArt database alone, it takes almost a day to import. There are chances that real time data might not sync right away. Some fields have not migrated correctly and may reflect wrong values, these are planned to be fixed in the upcoming reimport. You can always login to old system to cross check and bring any discrepancy to our notice. Just raise a ticket and we will be glad to assist. My plan is wrong / changed? We have merged quite a few plans appropriately without any loss of access or duration. Check changelog below for each club to know how membership plans have been restructured. Raise a Ticket if you have any doubts. I have old Developer plan, why not give me access to other clubs as per the new developer, after all the pricing is same? Read the “Our Intentions” section above. Read “Old Developers upgrades to Ultimate Plan” section above. Don’t panic, raise a ticket. Read the “Merging usernames and passwords” section above. Avoid creating new account on the Unified Portal to access ticket system, just email us. Email us at arvind@joomlart.com , we will help you out. Use only Ticket system or email for faster resolution. If your club has been migrated to new system, login and raise support Ticket HERE. It is not possible for us to be active on too many channels to provide answers. Single extension users moved to JA Extension plan. Expiry dates remains unchanged. They can access all extensions now. 3 months extension plan discontinued. 3 months users merged with JA Extension plan. Expiry dates remain unchanged. New Developer Plan introduced offering Developer level access (everything) to all 3 clubs. JA Pro Plus plan introduced. Check back on Monday, 12th March. Yes, there are high chances that few things might seem to be broken, please help us with your feedback and we will fix issues. Raise Ticket OR send quick mail to arvind@joomlart.com if you are facing issues with the new system.